You've probably guessed by now with the long gap since my last post, that things have been pretty busy here on the homestead. Winter is done, spring is here, and there is all that work outside to do. The vegetable-garden-to-be was a thick tangle of grass. We weren't sure how to get that fixed up since the tiller we got second hand last year sort of died part way into doing that. Of course, what got done was pretty much back to a tangle of grass again. To the rescue comes a neighbour from across the way with a big tractor pulling a heavy duty tiller behind. It's amazing how much easier things are when you have the right equipment. It turned out beautifully and we have a pretty big garden now just ready for planting. Meanwhile the renovation of Kevin's bedroom continues. But we are in the home stretch and so far things are shaping up nicely. 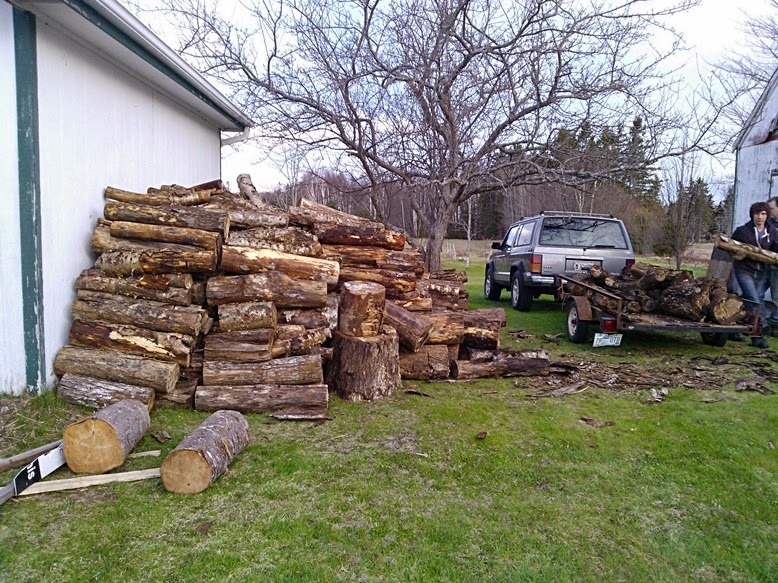 Things got a little sidetracked and progress slowed down when we had an opportunity to purchase some really cheap wood for the wood stove we don't have yet. It was a great price but the caveat was, we had to move it ourselves and we only had a week to get it gone. Thankfully it didn't have to go far since it came from the property next door, and the neighbour allowed us the use of his heavy duty flat trailer. So for a week, every night after work the boys lifted and stacked wood. I helped of course a little but mostly I used the car and our small trailer to move some building lumber and other stuff we got for free. Our neighbour is selling his property (a VERY nice place btw) and is trying to get everything cleaned up and nice for the listing. Needless to say, we are getting all sorts of freebies as he downsizes and cleans out storage areas. 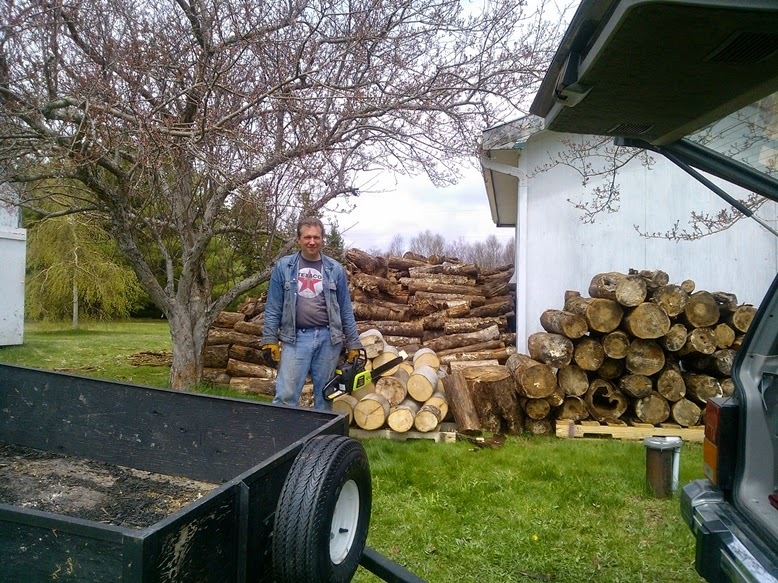 Then there was the tree hit by lightening that was leaning, which Todd cut down to firewood with the chainsaw. It seems that he's pretty happy using his Jeep and tow chains hauling fallen logs out of the woods and cutting them up with the chainsaw. This may very well be a new hobby of his. 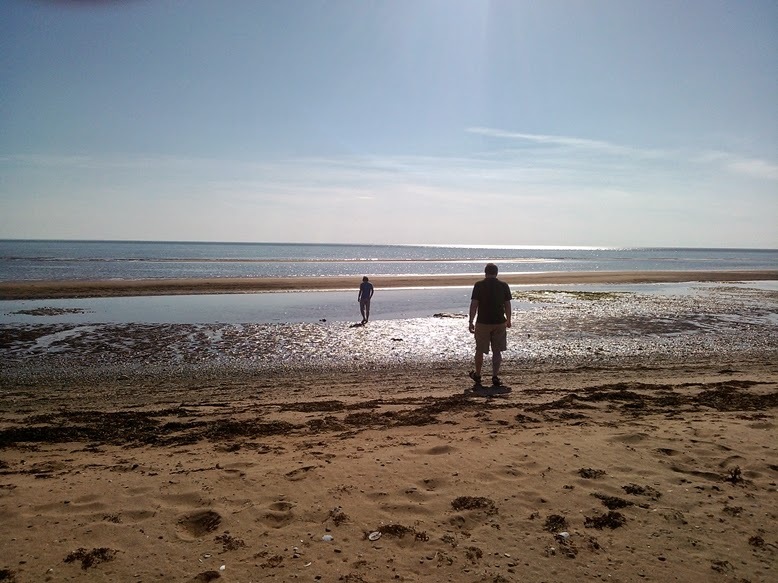 We've also had our first walk on "our" beach...well, not really our beach though we sometimes feel that way as often we are the only ones on it. Up until now, the road to the beach was impassable and though we did get down to some other beaches over the winter (hoping to see seals which we didn't) we weren't able to get to ours. And with the first beach walk of the season we also started having some bonfires in our little fire pit. The smell of smoking apple wood really gets the mouth watering for some BBQ though and since we don't really have one I improvised. One of the oven grates was utilized and once we got a good bed of glowing embers going we threw some steaks on there. Awwwwwesome! and so was the chicken we did that way the day before. YUM! Some wood we took apart from a circular garden bed in the back lended itself well as a border for the front bed which is already home to a few flowers including a giant peony. 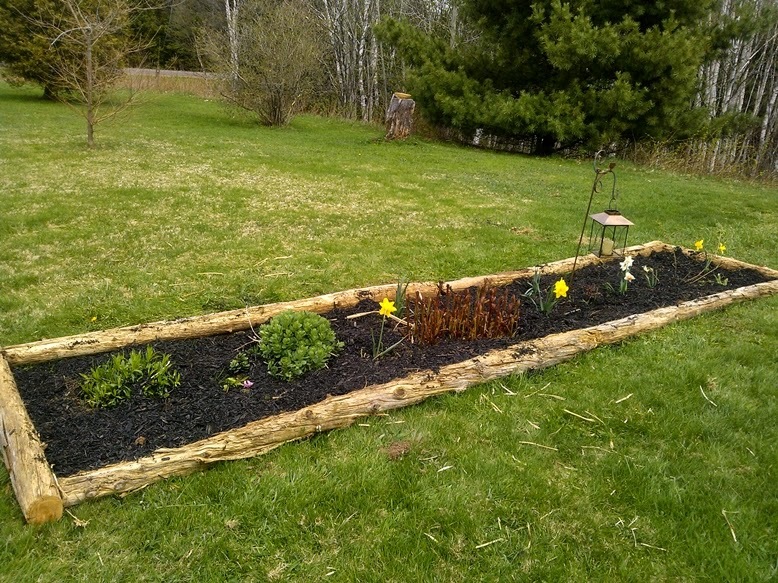 So we moved in a few of the daffodils to save them from the tiller when we did the vegetable garden, added some black mulch, and now we have a nice pretty little bed in front. 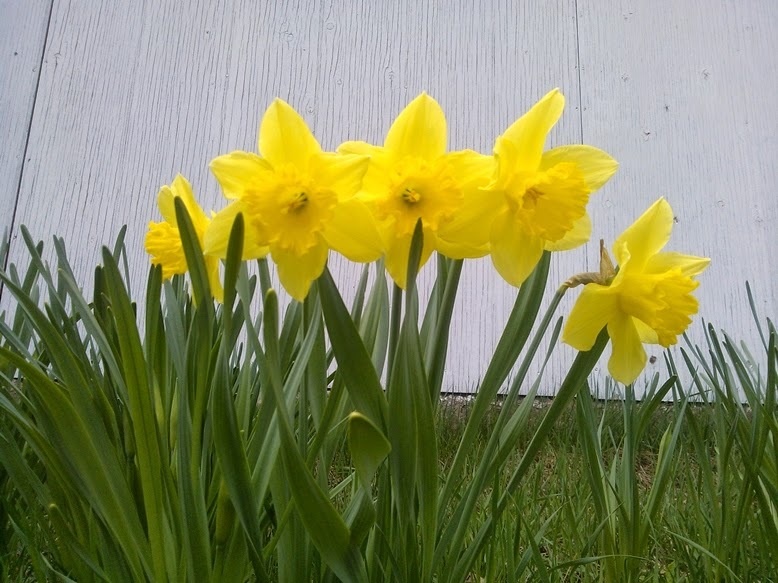 Daffodils and tulips are popping up all over the place and we are seeing more and more of the flowers that were planted here by the previous owners. We have yet to prune all the grapevines what with room renovating and hauling wood. Add in the rearranging of garden beds, running errands and the usual chores, there isn't much time left over. 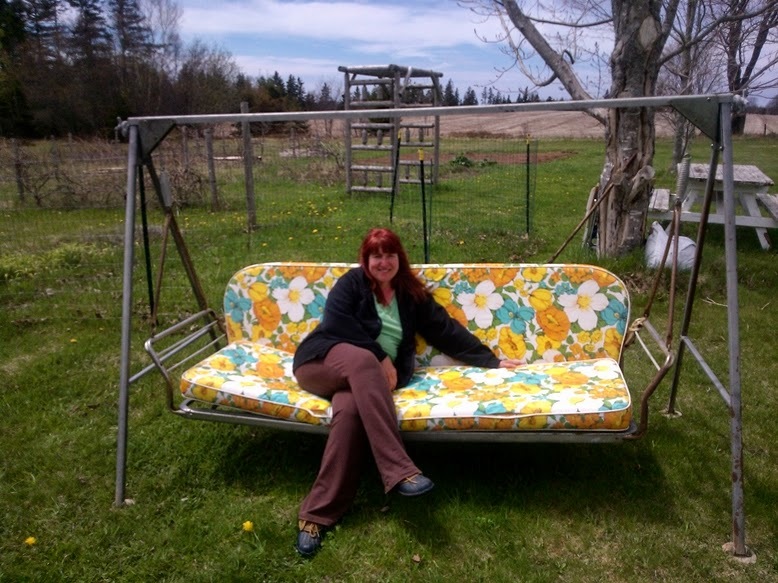 But once in a while you have to just take a minute to sit and relax on a bench swing, listen to the birds, and do some contemplating on how fortunate we have been so far in our little homestead adventure. Next up on the building projects is to start work on the cat run that we plan to build onto the house so that the cats will have a nice little playground that is safe from the coyote, fox and eagle. They will be able to come and go as they choose which will please Taz no end. After that is done the next thing on the list is the chicken coop, so that we can get those chickens and start eating farm fresh eggs. Oh happy day!